The Pend Oreille River ( /pɒndəˈreɪ/ pond-ə-RAY) is a tributary of the Columbia River, approximately 130 miles (209 km) long, in northern Idaho and northeastern Washington in the United States, as well as southeastern British Columbia in Canada. In its passage through British Columbia its name is spelled Pend-d'Oreille River. It drains a scenic area of the Rocky Mountains along the U.S.-Canada border on the east side of the Columbia. The river is sometimes defined as the lower part of the Clark Fork, which rises in western Montana. The river drains an area of 66,800 square kilometres (25,792 sq mi), mostly through the Clark Fork and its tributaries in western Montana and including a portion of the Flathead River in southeastern British Columbia. 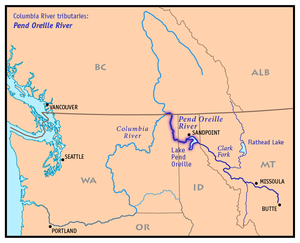 The full drainage basin of the river and its tributaries accounts for 43% of the entire Columbia River Basin above the confluence with the Columbia. The total area of the Pend Oreille basin is just under 10% of the entire 258,000-square-mile (670,000 km2) Columbia Basin. Box Canyon Dam is currently underway on a multimillion-dollar project for a fish ladder. In the previous Ice Age, a massive glacier of the Cordilleran Ice Sheet advanced southwards through the Idaho Panhandle, burying the Lake Pend Oreille and upper Pend Oreille River valley with ice hundreds to thousands of feet thick. This formed a pair of ice dams, one gigantic, and one significantly smaller. The one that caused the water of the Clark Fork and other smaller streams to back up into Glacial Lake Missoula, which stretched over two hundred miles southwest across western Montana, containing some 500 cubic miles (2,100 km3) of water, was over 2,000 feet (610 m) high. The second one blocked the upper Pend Oreille River near Sandpoint, creating an enlarged Lake Pend Oreille that could have connected with a similarly enlarged Kootenay Lake in the north. Water pressure and glacial melt destroyed the larger of the two ice dams several times, causing massive amounts of water to rush out across eastern Washington through the upper Pend Oreille River. A mistaken belief is that these cataclysmic floods, known as the Missoula Floods, traveled down the Pend Oreille Valley into the Columbia. Rather, it is now thought that the water completely breached the western divide of the Pend Oreille River valley and rushed out towards the direction of Spokane. Native people who lived along the river included the Pend d'Oreilles and Kalispel (considered as a single tribe by the Bureau of Indian Affairs). Archaeological evidence suggests that people lived in the region as early as the end of the last Ice Age, about 11,000-12,000 years ago. The name Pend d'Oreille or Pend Oreille is variously stated to mean "earring", "hang from ears", or "shape of an ear". Kalispel is thought to mean "camas people", referring to the roots that provided their primary food. Both tribes lived around the area of Lake Pend Oreille occasionally ranging lower onto the Pend Oreille River (or maybe they did have settlements along the river?) but the lower (north) basin was generally less populated than the upper (south) portion. The Flathead tribe inhabited the upper (Clark Fork) part of the basin, especially the Bitterroot Valley. The Ktunaxa lived just to the east of the Pend Oreille river. The first non-indigenous people to see the Pend Oreille were French-Canadian fur trappers working for various fur trading companies to provide beaver pelts to trade overseas. Some of these people were the ones to coin the term "Pend d'Oreille". Canadian explorer David Thompson saw the river in 1807, after a long and arduous journey from Saskatchewan. His primary mission was to find the source of the Columbia River (Columbia Lake), which he did. Afterwards he proceeded to establish trading posts throughout the region, including Kullyspell House on the north shore of Lake Pend Oreille. In 1808, Thompson again traveled into the Pend Oreille region. The following spring, he tried to reach the Columbia River by way of the Pend Oreille, but rapids and waterfalls hampered his attempt. He ended up retreating to another trading post in British Columbia a few months later. After these early explorations, however, there still were no permanent white settlements along the Pend Oreille River. 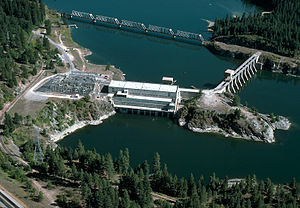 Numerous dams upstream along the Clark Fork (Cabinet Gorge, Noxon Rapids and Thompson Falls) and Flathead (Kerr/Flathead Lake and Hungry Horse) also generate power and to a lesser extent regulate the inflows to Lake Pend Oreille and the Pend Oreille River. This page was last edited on 6 December 2018, at 19:07 (UTC).